Since 1994, Experts.com has been providing millions of users worldwide with access to the information and expertise that they need. As one of the nation's most established and premier Internet registries, Experts.com serves as a who's who of experts at the top of their respective fields. 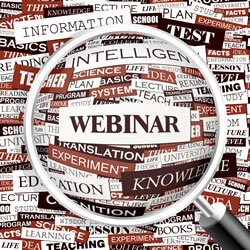 Thank you for your interest in Experts.com's Webinar services. Experts.com was established to offer professionals a platform to showcase their expertise and monetize their knowledge. Facilitating webinars for our members allows them to communicate their knowledge to a geographically wide audience, promote awareness, build relationships, and generate leads that will eventually convert to profits. Members who take advantage of the service will be able to link the webinars, along with books, articles, and video files to their Profiles on Experts.com and on their own websites. If you are interested in learning more, please complete our short Webinar-Interest Form. Upon receipt of this completed form, one of our Member Success Representatives will contact you to discuss the webinars in greater depth. We thank you for your interest and look forward to serving you. If you have any further questions, please contact us at Support@Experts.com.